Just finished the last page of the 3rd book (literally 5 minutes ago)!!! OUTSTANDING!!! I started last weekend re-reading the first one; and, I never read the 2nd one, waiting in anticipation of the 3rd one! So, I read all 3 within the week. What a great game plan!! I recommend them all!! Great Job. Finished the third in the Alexis Marsh thriller series. These books are written with mystery, love, lust and action. This is one of the books that when you start reading, you can't put it down until you are finished. Absolutely the best reading. Can't wait for the next book! 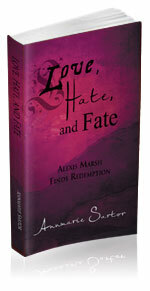 I’ve read all three books of Alexis Marsh and have enjoyed them thoroughly. This third book continues with love, suspense, mystery and surprise. There is never a dull moment with Alexis Marsh. Keep the books coming! These books so good!! I got the first 2 at the same time and read them so quickly!! I remember thinking that there HAD to be another book because I HAD to know what happened next!!!! And I now have the 3rd book!!!!!! WOW!!! Yes, I loved the ending!! A couple of women said that they were going out to get themselves a “little something for Christmas.” I thought as I heard them, I am going to do a little something for myself for Christmas, I am going to read Annmarie’s finale. Once into it, I was so aggravated when I had to put it down to do something else; and basically, I just ignored everything and everybody around me until I finished. As a person who really doesn’t need a whole lot in the way of things, even I would have a difficult time finding a “gift” for me. The book was it! Thank you sooooo much. Now I am waiting for your next work product! Type your comment below. Comments are moderated and will not appear immediately.